Hep Hep Riots - The emancipation of the Jews and the rise of nationalism, rather than eliminating European anti-Semitism, exacerbated the problem. One of the most advanced countries in respect of Jewish emancipation and assimilation was Germany, birthplace of the Haskalah. The emancipated Jews, so proud of their achievements, soon found themselves the objects of intense hate because of commercial and social competition, and ironically, because the Jews were such ardent nationalists, making them the target of anti-nationalists. The governments of the several German states rescinded many of the privileges granted to Jews. The Jews, conscious of their hard won status and unwilling to be subject to humiliating laws such as the one limiting the community to 12 marriages a year in Frankfurt, protested. This gave rise to a new wave of anti-Semitism. 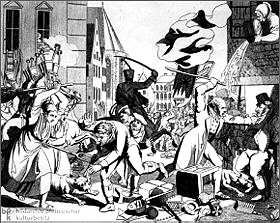 Against this background, riots broke out throughout Bavaria, beginning at Wurzburg in August ot September of 1819. As in the Crusades of the Middle Ages, the rioters screamed "Hep, Hep," illustrating the continuity of the anti-Jewish tradition. Frankfurt Pogrom: At left, a woman is attacking a Jew with a pitchfork, while a gentleman in a suit is attacking another Jew at right, and a tenant is pouring water or waste water down on the attacker. Troops were called in to quell the Wurzburg riots, but new disturbances sprung up throughout Bavaria, then spread to Bamberg, Bayreuth, Darmstadt, Karlsruhe, Mannheim, Frankfurt, Koblenz, Cologne and other cities along the Rhine, to Heidelberg and to Bremen, Hamburg, and Lubeck. The riots in Hamburg on September 1 spread to Copenhagen, where the rioters were sailors and burghers, and to the neighboring villages. They had to be suppressed by troops. Anti-Jewish disturbances also took place in Riga, Cracow, and Prague. The government generally protected the Jews on the one hand, but also explained, somewhat cynically, that further rights could not be granted to Jews because they would provoke more riots. German Jews, intent on assimilation, suppress the details, and the significance of the riots was minimized in Jewish Haskalah and Reform circles. The periodical Sulamith barely mentioned the riots for fear they might "weaken our coreligionists' love for our Christian fellow citizens". This pattern of denial and suppression inaugurated the reaction to anti-Semitism that remained typical of most German Jews until, and even after, the rise of Hitler. At the same time, Jews used their newly earned economic and political clout to quash the riots. Jews stayed away from the Frankfurt fair in droves, and the Rothschild family threatened to leave Frankfurt if order was not restored. There were several further "Hep Hep" pogroms, but the movement died out in the 1830s.